Whiteparish is a village and civil parish on the A27 about 7.5 miles (12.1 km) southeast of Salisbury in Wiltshire, England. 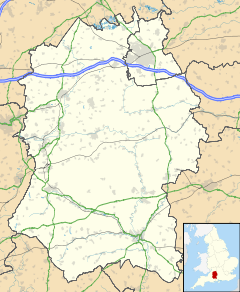 The village is about 1.5 miles (2.4 km) from the county boundary with Hampshire. The parish includes the hamlets of Cowesfield Green (east of Whiteparish on the A27) and Newton (southwest, near the A36). Cowesfield was recorded in the Domesday Book of 1086, together with nearby settlements at Alderstone (now extinct) and Frustfield (which became Whiteparish). The place-name 'Whiteparish' is first attested in 1319. It was earlier recorded as 'la Whytechyrche' in 1278, and 'Album Monasterium' in 1291, which both mean 'white church'. The reference is presumably to a stone or whitewashed church. The parish falls in 'Alderbury and Whiteparish' electoral ward. The ward starts in the northwest at Alderbury and stretches south east to Whiteparish. The ward population taken at the 2011 census was 4,261. The Church of England parish church of All Saints is Grade II* listed. It has 12th-century origins and was restored by William Butterfield in 1870. A painting St Peter denying Christ is by J F Rigaud. A Methodist church was built on Dean Lane in the 19th century. It was sold for residential use circa 2012. Whiteparish All Saints Church of England Primary School teaches children from a nursery class up to year 6. In the middle of Whiteparish, it has about 150 children, some from outside the village. A school for teaching reading, writing, and accounts to twenty poor children had been founded at Whiteparish by the gift of J. Lynch in 1639. In 1833 this school was teaching thirty-five boys. There was also a girls' school, founded in 1722 by the Will of E. Hitchcock, which in 1833 was teaching twenty girls the Church catechism, reading, and needlework. From 1842 there was a National School on the site of the present school, which educated children of all ages until 1955. The village previously had four public houses, but two have now closed. The first to close was the White Hart, around 1990. The site was developed into four houses in 2006, although the pub sign still exists on the opposite side of Romsey Road at the entrance to the recreation grounds. The Fountain Inn closed in 2015 and was converted to a residential property in 2016. The parish has two biological Sites of Special Scientific Interest: Whiteparish Common and Brickworth Down and Dean Hill. ^ "Wiltshire Community History - Census". Wiltshire Council. Retrieved 21 May 2015. ^ "Whiteparish". Wiltshire Community History. Wiltshire Council. Retrieved 17 July 2015. ^ Eilert Ekwall, Concise Oxford Dictionary of English Place-names, p.514. ^ "Alderbury and Whiteparish ward 2011". Office for National Statistics. Retrieved 10 March 2015. ^ Historic England. "Church of All Saints, Whiteparish (1300179)". National Heritage List for England. Retrieved 17 July 2015. ^ Pevsner, Nikolaus; Cherry, Bridget (revision) (1975) . Wiltshire. The Buildings of England (2nd ed.). Harmondsworth: Penguin Books. p. 572. ISBN 0-14-0710-26-4. ^ "Methodist Church, Whiteparish". Wiltshire Community History. Wiltshire Council. ^ "Whiteparish All Saints CE Primary School". Retrieved 17 July 2015. ^ "Whiteparish School". Wiltshire Community History. Wiltshire Council. Retrieved 17 July 2015. ^ Historic England. "Abbotstone House, Whiteparish (1184644)". National Heritage List for England. Retrieved 17 July 2015. ^ "UK Genealogy Archives: Whiteparish, Wiltshire". Retrieved 2 December 2014. ^ "UK Genealogy Archives: Brickworth". Retrieved 2 December 2014. Wikimedia Commons has media related to Whiteparish.